With the World Cup picking up pace on the pitches of South Africa and fans flooding into stadia or in front of screens, I thought we’d take a little taste of another world tour today, in the company of the artist Robert Rauschenberg (1925 – 2008). Rauschenberg. What a rock star. He moved away from Abstract Expressionism when others were moving towards it and ultimately loosened the movement’s grip on American art. He invented the ‘combine painting’, a trail-blazing art form in which he mixed up an often out-there mesh of images and media: oil painting, screen-printed images, 3D things you’d buy at the market, a stuffed goat with a tyre around its middle: it all went into his mad melting pot. Then in the 1960s he started down the 2D path, using collage and newspaper images to make prints that said important things about modern life. 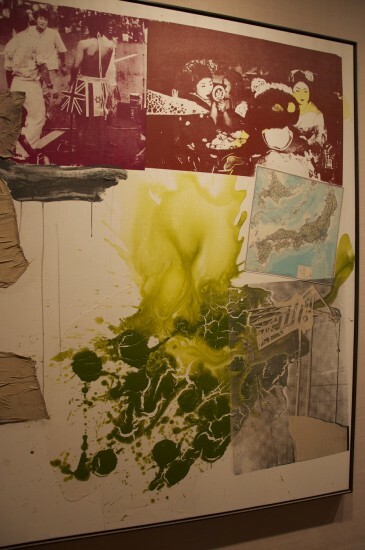 Rauschenberg said: “Painting relates to both art and life. A pair of socks is no less suitable to making a painting than wood, nails, turpentine, oil, and fabric.” See what I mean? The man’s a dude. We’re picking him up on his R.O.C.I. tour, which kicked off in Mexico City in 1985. The Rauschenberg Overseas Culture Interchange (R.O.C.I. – pronounced “Rocky” – for short) was an ambitious nonprofit project conceived (and in large part funded) by the artist to create communication with global nations through the language of art. 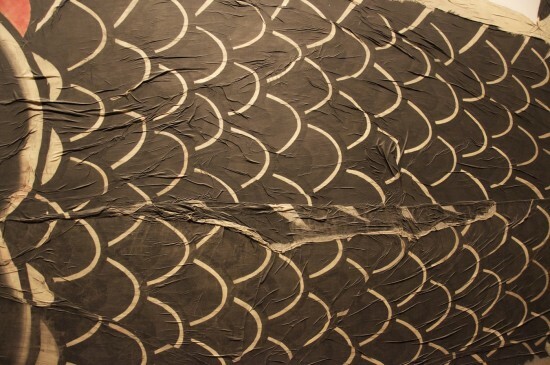 Our work today Wall-Eyed Carp/ROCI JAPAN (1987) was part of that project. Here’s the drill: R.O.C.I. goes to a country to work with local artists and artisans. They make art. He goes to a major museum in that country to exhibit that art (as well as what’s been produced in other R.O.C.I. nations) to the public. 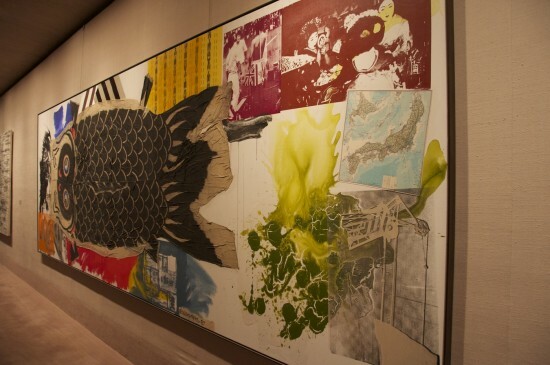 At each stop along the way, Rauschenberg leaves a gift of some art made there, as well as sending a piece from each outpost straight to the National Gallery in Washington! For a cumulative exhibition that took place there in 1991. Phew. By all accounts this was a sell-out tour. He attracted millions of viewers across the 22 participating countries (in China, 70,000 showed up during the first week alone). How thrilling then to come face-to-face with a proper piece of concert memorabilia: even Husband was star-struck when I asked him to photograph our Wall-Eyed Carp. And what a staggering work this is. It’s in the East Building tucked away in a lobby, right alongside the main auditorium. It’s huge (206.5 x 621 x 5.1 cm), with a Japanese fish kite plastered across it. The skin of the fish ripples and flays at the tail, lending instant texture and interest. Elsewhere around, there are swathes, splashes and strips of bright-colored paint, bleeding here, blotted there. Adding to the menu of marvelous variety are a map and photographic images of Japan. 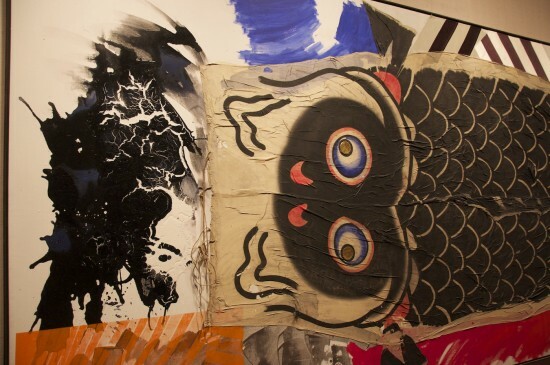 This eye-engaging work shows how richly Rauschenberg absorbed the materials, images, techniques and information from places and people he visited at his artistic stop-off points. Many say they see a rift in Rauschenberg pre-and-post world travel. I can well imagine it: whereas before, New York was his studio/ inspiration, once he’d broadened his mind and met so many artists, his vision was bound to blow up big time. Best of all is the message he talked about: “It has to be from people to people. We want to communicate our human kinship. I trust art to do that.” Did you ever hear a more moving and simple mantra for world peace and understanding? ey yo diz thing is soo chillin my manz rauschenberg getting his world cup spot lite thnx!